You are getting the best of care and most of all, love. Hi Scully! Happy Pet of the Day! Aww!!! What a beautiful, most precious Dwarf Netherland bunny you are, Scully, so soft and fluffy, just as sweet and loving as can be! How lucky your human is, having a "first" as special as you, sweetheart! Endless thanks to your human for dedicating a part of her days to volunteering at the animal refuge! It was due to her/his selfless dedciation she came to love bunnies, and born of that love was YOU! How lucky your lady is, having a beautiful, spunky, sweet and loving best furry friend in you! You truly are a treasure, Scully, beautiful inside and out, and so very deserving of your big day of honor! Thanks for the BIG smiles, cutie pie! Meeting you today, seeing your beyond heart-melting photos, has been a joy! I hope you're enjoying a very special day of celebration...playing to your heart's content, munching on yummy bunny treats, cuddling with your human, being loved and pampered to pieces! Lots of love, snuggles and smooches to you, precious Scully, our very special and most deserving Pet of the Day, EVERY day! Dearest Scully, you are the most adorable little thing, such a cute wee precious Netherland Dwarf Rabbit! You are absolutely beautiful, with that colorful fur that looks so soft and that sweet face with those lovely big eyes. And what a delightful personality you have, too! You are very energetic, and you make your dear person smile with your antics. You love to explore and get into things, drag around a cloth your dear person gave you, and run around his/her room. We are very grateful to him/her for volunteering at that animal refuge, which led to your joining the family as very first rabbit! You both love each other very much, don't you. What a wonderful love-filled home you share! 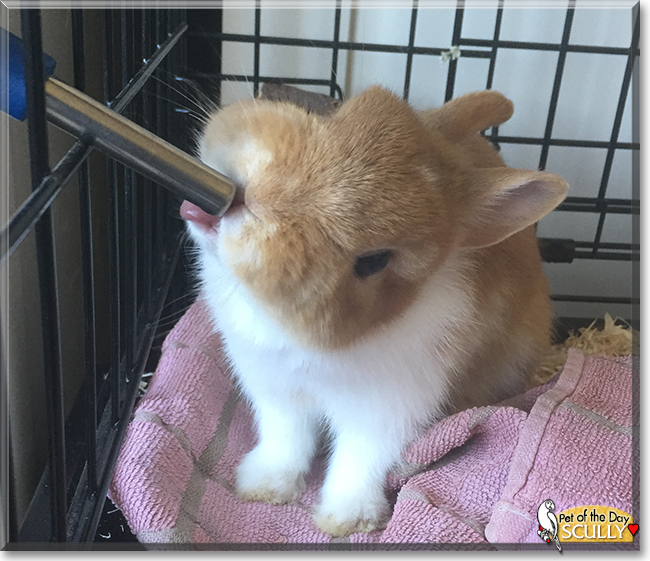 Congratulations, darling Scully, on being chosen today's Pet of the Day! We hope you and your dear person and all your family and friends are enjoying a fine celebration, full of fun and lovies and all your favorite games and treats. Scully is so cute I can barely stand it! OMG, who knew a wee bunny could be so adorable? Well, very wonderful Scully is POTD and off the charts excellent in every way!! What an adorable bunny you are, Scully. Congratulations on being Pet of the Day! 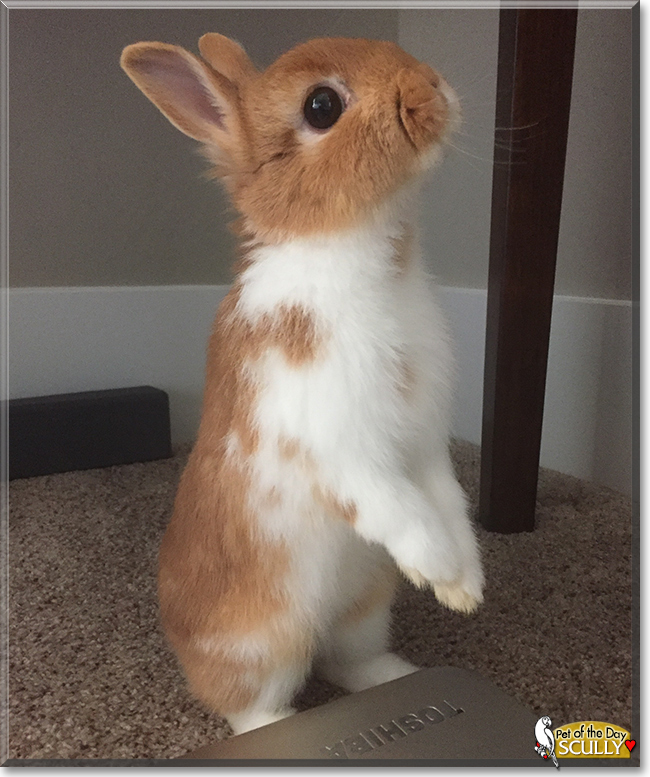 What a darling bunny you are, Scully! Happy Pet of the Day, cutie!